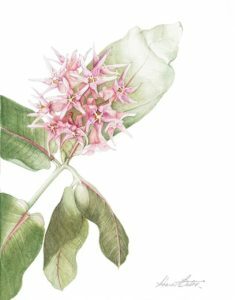 During the month of June, the Paquette Gallery will feature the art of the Rocky Mountain Society of Botanical Artists. illustrations of Cannabis specimens used in medicinal practice and craft until the advent of synthetic pharmaceuticals and fibers in the mid-20th Century, when the plant genus became excluded from commerce and cultivation. Reintroduction of the genus has produced an ever-growing variety of new strains: cultivar recognition is enhanced by good drawings. The Rocky Mountain Society of Botanical Artists is a nonprofit organization dedicated to promoting public awareness of and appreciation for historical and contemporary botanical art, and of plants with particular relevance. Our goals are to educate the public and the scientific community, to document botanical diversity, and to promote and expand traditional and contemporary illustration approaches, methods, techniques, media, and substrates. Creative Mixer: Thursday, June 14, 2018 from 5:30pm-7:00pm in the Paquette Gallery. Join the Salida Council for the Arts and the Salida Creative District in the Paquette Gallery for a fine and festive social hour from 5:30 to 7:00 pm. Munchies are served, the cash bar is open, live music will be playing, and a few artists from the Rocky Mountain Society of Botanical Artists will be there in person to ask about their work. You’ll even hear news about the many creative projects being launched.